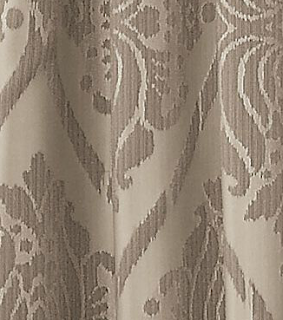 I recently spotted these curtains on a trip to JcPenney and was nearly stopped dead in my tracks. This photo (via their website) doesn't do them justice. They are from Cindy Crawford's line and are called Dubai Damask panels. They are currently $35.99, but just yesterday they were on sale for $29.99 so I'd keep an eye out for price changes if you're interested in purchasing them. Of course, if you want them now you can use the code HUGENESS to save $10 off any $25 or more purchase. These are sold separately so if you did two separate orders (with the promo code), you could get them for a total of $54 + tax. Get them shipped to the store, and you don't have to pay for shipping! 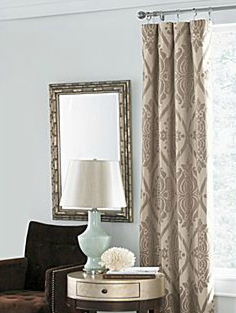 They come in 4 different color options and have a beautiful ikat print. Seriously, you have to see them in person to know their beauty, but I promise these are a steal!